MOSCOW (Reuters) - Authorities have sealed off Moscow's Red Square, its most famous landmark, at the height of the tourist season -- apparently out of fear of bomb attacks by Chechen rebels. A hand-written sign taped to a metal barrier leading into the square, which runs along one side of the Kremlin -- the seat of Russian power -- said: "Red Square is closed until September." Police contacted Thursday refused to say why. "The square is closed, but we are not prepared to comment on the reason," said a spokesman for the Federal Guard Service that guards the Kremlin and surrounding areas. But Izvestia newspaper said its closure was due to fears of attacks on the landmark following two bomb attacks in the capital earlier this month. Fifteen people died from their injuries when women suicide bombers blew themselves up at an open-air rock concert on July 5, and a third woman left a bomb outside a restaurant on July 10 that blew up, killing a bomb-disposal officer. The Kremlin blamed the attacks on separatist guerrillas from the rebel Chechnya (news - web sites) region. The cobbled square normally throngs with tourists eager to have their photographs taken against a backdrop of the Kremlin's red brick walls, the granite mausoleum housing the mummified body of Soviet state founder Vladimir Lenin or the ornate onion domes of St Basil's cathedral. But Thursday tourists, many from as far away as Japan and the United States, stared glumly over the barrier leading into the square, craning to get a glimpse of Lenin's tomb. Some questioned the point of shutting the square. "If someone wants to do something bad, they will always find a way. Where's the sense in closing a square, they should work on security before things happen, not after," said Matjaz Oysterlek, a tourist from Slovenia in Moscow with his family. And street traders said the ban was hitting them hard. Nikolai, 64, a photographer who normally takes pictures of tourists in front of the domes of St Basil's Cathedral, said the summer months were normally his best time for making money. "They have closed my workplace, I am losing a lot of money," he said, declining to give his surname. "People come to Moscow to see Red Square and the Kremlin, but now they just get to stand here and look at the gates." 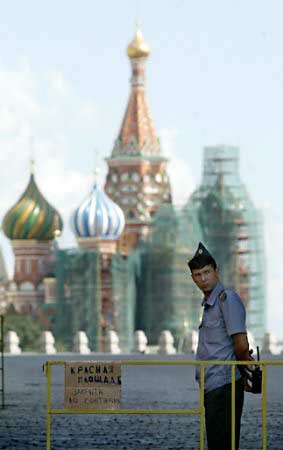 Security has been tight across Moscow since the attacks. Police said they found a guerrilla training base outside Moscow last week, and have been even more vigilant than usual in checking documents of pedestrians or users of public transport.